On Tuesday 9/09, I arrived in Montpelier mid-afternoon. This part of my journey to begin my life in an RV, was done solo from Denver. I really enjoy driving, sometimes in total silence, sometimes with talk radio or music, and sometimes with books on tape. Sunday night was spent in Grand Island, Nebraska, and Monday in Princeton, Illinois. The terrain was very flat, and there was much road construction in all states. Days were uneventful, but the night in Princeton was interrupted by the motel fire alarms ringing loudly. Four fire trucks and the volunteer firemen showed up in full gear, all to no avail. The halls smelled of hot electrical wiring, but nothing was found. Guests were asked to wait in the parking lot, nearly an hour, and it was windy and chilly. I will be spending a week with my very dear friends in Montpelier, then on September 16, I am off to Goshen (Elkhart), Indiana to attend my first five days of RV learning. RV Dreaming is putting on a rally covering many topics related to RV living. There will be seminars, RV walk-throughs, tours, games, and fellowship. Each seminar I attend will be another step in my decision-making process for which RV to finally call home. The excitement builds! 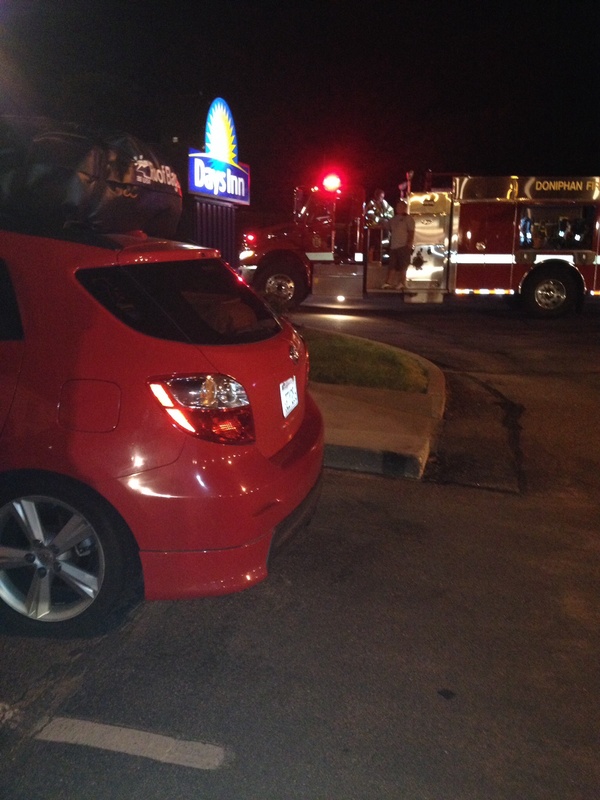 Princeton motel fire alarm goes off in the middle of the night. Thanks for being faithful in your prayers! We appreciate it. Today I got three notifications on my regular e mail. So good to get caught up with all your travels. Now that I know what to look for on your blog,Ha. What a wonderful experience you are having. Take care of yourself out there in the big world!! Missing your posts. Hope you are alright! All is great! I am doing regular posts and then some pages as well. If you’ll scroll down the sidebar, you’ll find links to both. I need to find out from my site host whether “pages” are sent as notifications to my followers or just posts are.